Venezuela has number of problems on its hands lately, one of which had been toilet paper shortages predictably caused by its awesomely awesome socialist revolution. This is fitting, because its economy has been spinning down the drain. 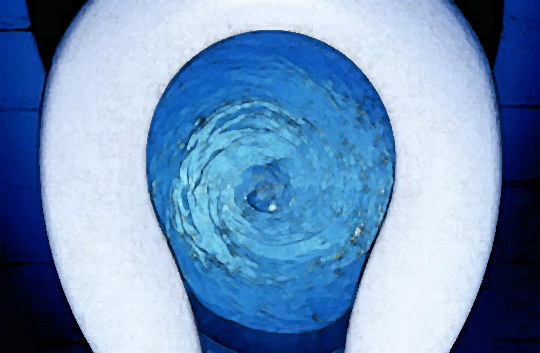 Now, Venezuelan president Nicolas Maduro has a bright idea for preventing the flush from completing — spin faster! Looting, indeed. When you go after private property owners — at gunpoint — call them “bourgeois parasites,” and tell the people it’s all being done in the name of “fairness,” lawlessness ultimately will rule the day. While the country is immersed in Obamacare headlines and a congressional tussle over delays and mandates, the Obama administration is stealthily moving toward unprecedented control over private property under a massive expansion of the Environmental Protection Agency’s Clean Water Act authority. The proposed rule, obtained by the House Science, Space, and Technology Committee in advance of EPA Administrator Gina McCarthy’s testimony at a Thursday oversight hearing, widely broadens the definition of waterways over which the federal government has jurisdiction to as little as a water ditch in a backyard. The Clean Water Act redefinition of “waters of the United States” would include all ponds, lakes, wetlands and natural or manmade streams that have any effect on downstream navigable waters — whether on public lands or private property. To see how this works, one needs to look no further than the early roll out of Obamacare. Already, politicians are blaming the insurance industry for the economic fallout of their own policies. Individuals who understand basic economics predicted millions of people would lose their plans, that prices would go up, and that the Affordable Care Act would in fact not lower the underlying costs of the health care industry. Now that the writing is on the wall, even Diane “I think you might be a terrorist some day” Feinstein is trying to find a way to avoid the political fallout. The world was always complex, but as technology advances the world’s perpetual busybodies will become increasingly frustrated. There are too many moving parts. Billions upon billions of voluntary transactions take place ever day between complex spiritual beings with free will. One camp seeks to control the uncontrollable — which has a historical track record of ending in tyranny — and the other believes that the free market (another imperfect system in an imperfect world) is still the best system ever devised for allowing man to obtain his full potential while pulling countless others out of poverty. Americans should watch what is happening in Venezuela, because in many ways it is giving us a glimpse into the future if we refuse to change course. Update: I’ll be on NPR’s “Wait…Wait…Don’t Tell Me” on Saturday, Nov. 16 talking about Venezuela. Luckily for us, we do have some people who are fighting against statists, but what’s disturbing is that so many people seem to be A-OK with statism. If the EPA were try to seize my property, I’d fight them tooth and nail. Do these thugs even understand the concept of private property? I don’t think so. I remember back in high school I was hanging out with my friend across the street and a group of people cut through his yard. He and his mother yelled at them for cutting through private property. Their response? “This land belongs to everyone, you fascists!” I kid you not. And we all know how progressive statists view the Founding Fathers. They always bring up, “slave owners” in order to try and make you out to be a “racist.” They were brilliant men, and like all humans, were flawed, but you cannot project modern values onto the past. Period. One camp seeks to control the uncontrollable — which has a historical track record of ending in tyranny — and the other believes that the free market (another imperfect system in an imperfect world) is still the best system ever devised for allowing man to obtain his full potential while pulling countless others out of poverty. the only people who will take you seriously are partisans. who gave us the Patriot Act? who ignored the free market and used the taxpayer to bail out Wall St? if Republicans are able to suppress enough votes of brown people, and turn out the angry white people constituency and win the White House (quite the long-shot), then they will resume the tyrannical trend Obama’s team has carried forward from Bush’s disastrous reign. Did I say “Republican” or “Democrat”? No. I was talking about two different visions for the world. Regardless, I don’t care who you think takes me seriously. I’ve stated that multiple times, so I’m not sure why you keep bringing it up. then truly stand up for the individual, Doug. describe the affront, for example, on new government requirements for voting. decry the continued bailouts of the financial industry, because the free market should never include institutions that are “too big to fail”. let consenting adults with the same genitalia marry each other if they want. advocate for an end to the war on drugs. You refuse to take my advice — you write on whatever you want on ‘The Lizard19 Truly Standing Up for the Individual Blog,’ and I’ll do the same here. I also find it strange that you would say that no one except partisans take me seriously on a blog post that mentions an upcoming appearance on NPR. Your timing must be off today. Isn’t NPR supposed to be the one radio station “evolved” individuals listen to? I had a pleasant conversation with the host. I’m very grateful that they gave me such an opportunity. I know exactly what you will continue doing, selective ideological attacks on predictable political targets. cheers! Didn’t you say you had a child? It’s bizarre that you spend so much time reading a site that bothers you, leaving trollish comments and sometimes even going so far as to write blog posts about the content here. Go spend time with your family. As I said multiple times: grow up. Supress the vote of brown people? Uh-huh. You mean, by requiring that people actually have an ID in order to vote? Gimme a royal break, troll. Voter ID laws are just plain common sense, a vast majority of Americans of all stripes support such laws. and guess what? An ID is not hard to get. It’s easy. “then truely stand up for the individual….”; such a fine example of that with personal shots aimed at Carl and Jim when they express their individual thoughts; you have some thought provoking ideas but lose credibility with your inability to discuss without insults….and apparent trolling. I know, I keep forgetting it’s only ok for the blog host to make personal attacks. It’s always someone else who is at fault. You would think that after guys like Lightbringer and Denver Pat (who defended your points during the Walmart post) took you to task, you’d learn. I guess not. It looks like Lizard19 needs more time to think through his behavior. If you’re going to comment here, you’ll learn something about humility and tact. Think about it until December. Until then, don’t expect your comments to show up. See you after Dec. 1. If not, I wish you the best. Ha, well if he’s banned and Walmart comes up, I guess I’ll take up Lizard’s torch on that one, because I think they are an unethical company; but that is a different discussion for a different time. All I’m saying, is I would hope more than just me and Lightbringer like reading different viewpoints; cheap personal shots takes away from the issue at hand and may cause someone not to post. I may just have to do another Walmart post just to get your blood pressure going. We’ll see… Regardless, Lizard19 can think of your advice for a couple weeks. I hope he takes it to heart. Hey Douglas, if you could go back in time and tell the founding fathers (not Jefferson, the Deist punk. He’d probably use one of the things I have to say next to affirm his point about his Jeffersonian Bible) one thing about Darwinism, one thing about Marxism, and one thing about Nietzsche, one special thing that can be anything you want that doesn’t have to be political, what would you say? Honestly, I don’t have the energy to think about Nietzsche questions for Jefferson right now. Something Maduro-related? Maybe. I have three hours left to dead lift, shower, and possibly write something before I pass out. I also have to work tomorrow. Note: Lizard19 didn’t think I was serious about coming back in December. No — seriously — think about your behavior until December. Then come back and act appropriately. Or not, and we’ll repeat the process until it sinks in. His post has been deleted.